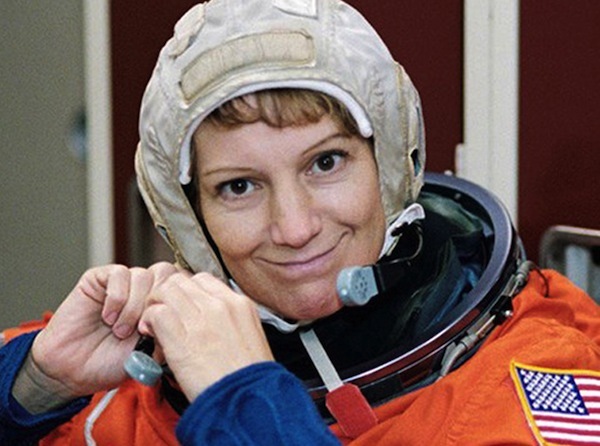 Eileen Collins, the first American woman to command a spaceship, turned 57 today. Happy birthday! Be it known that I, EDMUND D. BARBOUB, of the city of Boston, county of Suffolk and State of Massachusetts, have invented a new and useful Improvement in Calculating-Machines; and I do declare that the following is a full, clear, and exact description of the same, reference being had to the accompanying drawing forming part of this specification, in which Figure 1 is a plan of case A and of device for moving the registering-slide; Fig. 2 is a section of device for moving the registeringslide; Fig. 3 is a section of case A on line a a of Fig. 1, and of the registering-slide on line Z) Z) of Fig. 4:; Fig. 4 is a plan of the registering-slide, Fig. 5 is an elevation of case A and front plate of the registering-slide on line 0 c of Figs. 3 and l; and Fig. (3 is an elevation of lever for carrying from one denomination to another.